﻿​Go bigger and better! Apply everything you have learned about Renaissance Tan Tiles and techniques to a large Linen Canvas Panel. 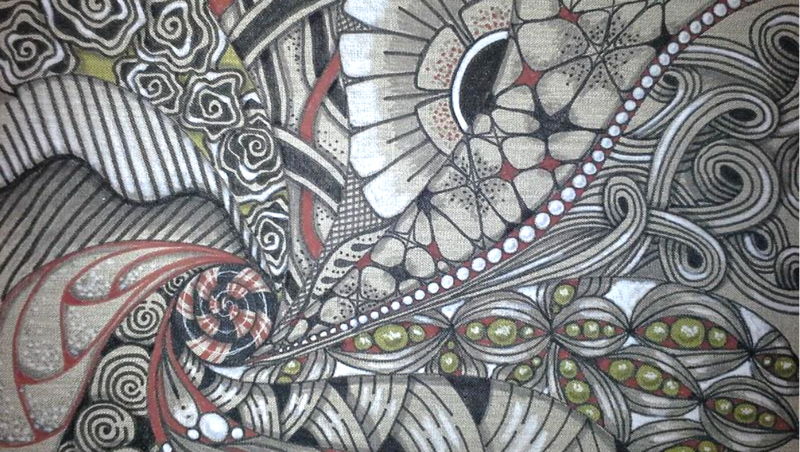 Using quality pain and ink pens, you will create a stunning piece of art for your wall! What a great class to bring home to your students! It will be packable, frame- able and easy to take home with you! Who doesn't love miniatures? We confess to a real fondness for anything tiny. Our lovely Zentangle ® Bijou and 3-Z tiles provide the opportunity to quickly embellish a surface and with instant gratification. 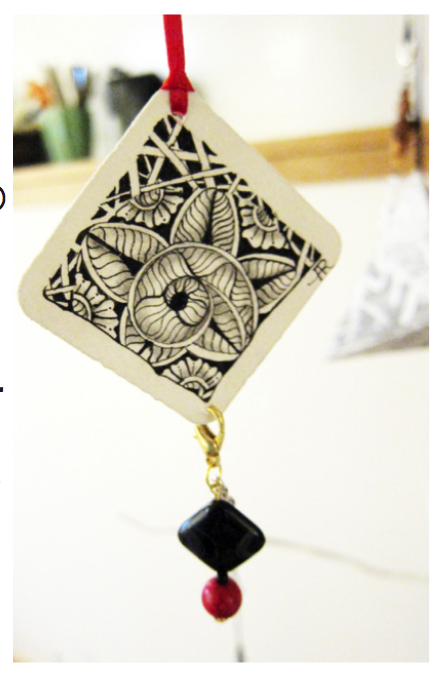 Because they're small they are a wonderful way to share the Zentangle experience with your students! These tiles lend themselves to hanging ornaments. In this class you'll complete tiles and finish one out as a beautiful dangle with bass and ribbon. Use the dangle to decorate a Christmas tree, hang in a window or embellish a gift. You and your students will be charmed by these tiny tiles! This ZIA is inspired by Portland’s Forest Park. 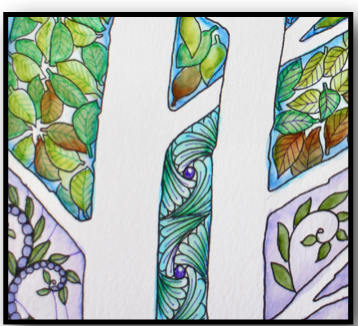 Leaves, moss, trees and critters are blended together in glorious color and tangles. Blending techniques with the Tombow Dual Brush Markers and working with the new Drawing Pens and TwinTone Markers we will create and enchanted forest with new tangles and tangleations with step outs also included. This will be your next great ZIA class to teach! Tangled decorations for anything that’ll stand still! Understand the anatomy of Dingbatz that will support you in drawing balanced designs both in placement and in texture. 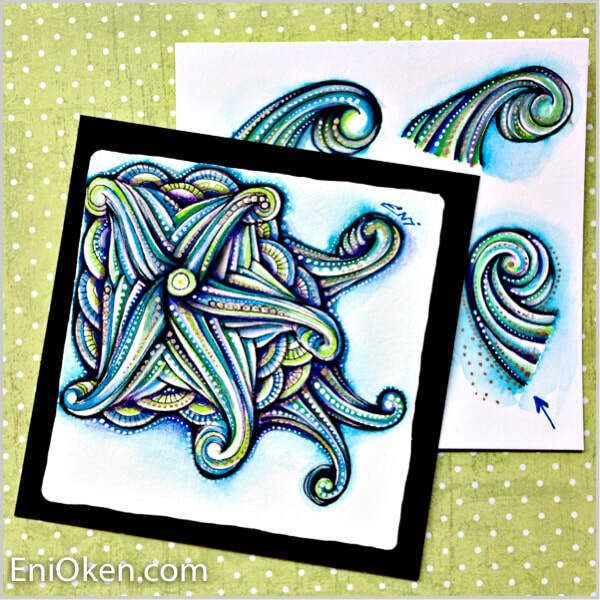 Learn how to draw Dingbatz using classic Zentangle skills as a foundation. This includes suggestions on the types of tangles that play well with others to make your Dingbatz as delicious as possible. ​Use Dingbatz to decorate a “commonplace book,” for you to add letters, poems, proverbs, quotes, recipes, or other information just as Emerson and Thoreau once did. We’ll also experiment with adding pizzazz to plain notecards, envelopes, and bookmarks. Chalk art is the latest rage! This trendy medium is quite versatile, forgiving, reusable, universally available and affordable. This class will explore chalk art style lettering – a way to create your own signage to celebrate big and small events in your lives. We will first explore design elements including basic lettering and placement on paper. . Common elements like banners, wreaths, laurels and botanical line drawings along with our stash of tangles will open a new door to creativity and expression. The biggest benefit of chalk lettering over other styles is that it is temporary. Chalk won't last forever. With that knowledge in mind, it allows you to really push the boundaries and experiment. 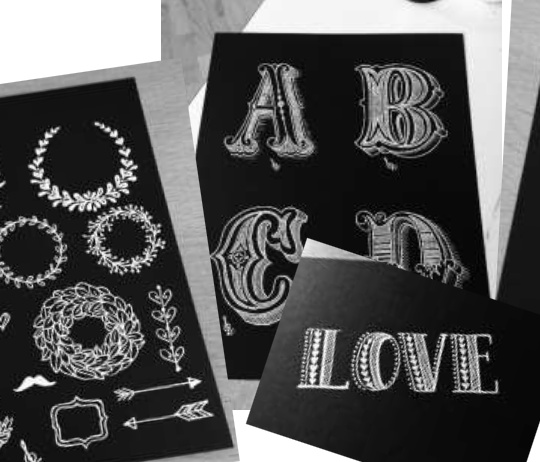 You’ll walk away from this class equipped with a new set of skills to create your own style of chalkboard art for your home, office or upcoming event in the family.